From work anniversaries to promotions to hitting sales goals, there are a wide variety of tried-and-true employee milestones that most companies recognize … but what about the less traditional opportunities for celebration? Employee recognition is an important part of building an engaged and productive workforce. 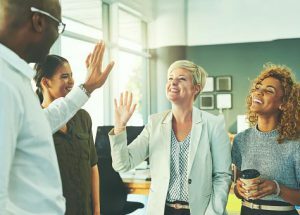 According to research from Bersin & Associates, companies with effective recognition programs have 31% lower voluntary turnover than companies with ineffective programs. And with top talent becoming harder to find in today’s economy, programs that focus on retention are a key strategy for companies to maintain their competitive edge. However, the type of recognition you celebrate can make a difference. The Bersin & Associates study also showed that 87% of recognition programs focus on tenure, despite that the fact that such focus has little or no relation to improved employee or business outcomes. So, as you think about your employee recognition strategy, think outside the box and consider a few of these non-traditional celebrations that can have an impact on work-life balance and create a more fun and engaging work environment. The idea here isn’t to reward failure or to rub it in an employee’s face when they fall short of achieving a goal, but rather to highlight the lessons learned from big mistakes and how the employee or team responded. There’s plenty to learn in the face of failure, so when someone takes a hit but keeps pushing forward, celebrating their mental fortitude, problem-solving skills, and ultimate success helps set a standard for excellence others can follow. Although they will likely consider it just doing their job, public recognition for employees who go above and beyond the call of duty in service of a project or initiative at work or in their community fosters a team environment based on giving back. And companies that show a commitment to service often see increased satisfaction and retention among its employees. As the Proverb goes, “as iron sharpens iron, so one person sharpens another.” Recognizing the role spouses play in each other’s work lives shows commitment to work-life balance. From taking the kids to school to helping maintain a safe and comfortable home, the commitment two people make to support each other is a cause worth celebrating. The skills gap is ever-widening, so celebrating when an employee receives an MBA or completes a new certification helps show the company’s commitment to ongoing development and keeps talented employees from seeking opportunities with other companies. In a study conducted by Virginia Commonwealth University, researchers found employees of companies that allow dogs in the workplace experience less stress and greater job satisfaction. So, why not take time for a fun—and teambuilding—birthday celebration for employees’ pets each month in appreciation of the impact they have on their humans’ states of mind and wellbeing. What are some non-traditional employee milestones you celebrate with your team? What is the impact on engagement? Let us know in the comments section below!